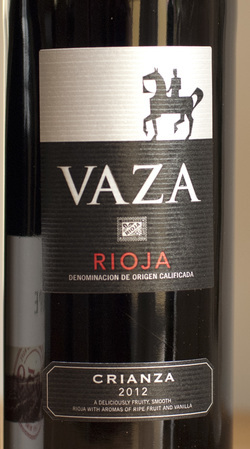 From the winemaker: Vaza Crianza is a wine with a particular personality, made entirely from Tempranillo grapes, and carefully aged in French and American oak barrels for at least 12 months. Intensely deep in color, a feature of this vintage. Fresh, bright aromas, dominated by the tertiary aromas of oak ageing prior to swirling the glass, but once the wine is aerated woodland fruit aromas start to take over, with persistent notes of black licorice and vanilla. On the palate, as the wine opens up, there is a positive note of tannin, a powerful structure and a medium acidity, all very typical of the 2012 vintage. The opening palate also highlights the barrel aging process, but the finish is full of fruit and very long.